The Federal Reserve Central Bank is a private monopoly of the nation’s money and credit issuance supported by the coercive power of the state. That the Central Bank is under Rothschild control is vital for the New World Order to be firmly established throughout the governmental, business, intellectual and political spheres of society. This is what President Trump is up against. Like President Andrew Jackson, whose statue towers in significance behind him, President Trump must summon all his strength, as well as Divine strength, to counter the growing tyranny of the Federal Reserve, before it firmly establishes draconian control with its cashless economy measures. To say “Americanism and Globalism” is entirely ridiculous and unworkable. The two are irreconcilable. The manipulating Federal Reserve is destroying Americanism and rapidly advancing the tyranny of globalism. The Central Bank is the primary monopoly on which all globalist monopoly power depends. The Federal Reserve is the bulls eye on the target President Trump wants to hit, dismantling it with all the serious finesse of an Andrew Jackson. Dismantling includes all affinities of the Federal Reserve with the military/industrial complex, the latter which endlessly prospers the former. The occult (secret) power of the Central Bank to create money out of nothing is the fountainhead that fuels the globalist financial and political empire. In the following is discussed a few of the ways this secret money power is brought to bear. The power of the anti-American and anti-Constitutional Central Bank flows from its control over the points of entry into the economy of new, inflationary money which it creates out of thin air. Bills of exchange, acceptances, private bonds, government bonds and other credit instruments are purchased by the Central Bank through “specially privileged” dealers, in order t put the new money – often only checking account entries – into circulation. The dealers are allowed a large profit since they are fronts operated by Federal Reserve agents. The Central Bank purchase of government securities pleases the political-class government, as its purchase of private debt pleases private debtors. Central Bank agents are given directorships, managerial posts, and offices in the corporations and governments so benefitted. When the Federal Reserve finally ends the easy credit to “combat inflation” – which they have caused – the enterprises and governments either fall directly into Central Bank hands, go bankrupt, or are “rescued” at the price of total control. Just a hint of insolvency from the respected Central Bank “authorities” is enough to cause a run on a disobedient bank or at least dry up its vital lines of credit. Soon the wimpy banking establishment earns to follow the hints and nods of the Federal Reserve agents automatically. The periodic cycles of easy money and tight money that the anti-American elite initiate through their control of the Central Bank causes corresponding fluctuations in all markets. The Federal Reserve inner circle knows in advance the timing of these cycles and, therefore reaps windfall profits by speculating in commodity, stock, currency, gold, weather derivatives and bond markets. Monopolistic stock and commodity Exchanges are a vital adjunct to the power of the globalist elite, made possible by Central Bank power. 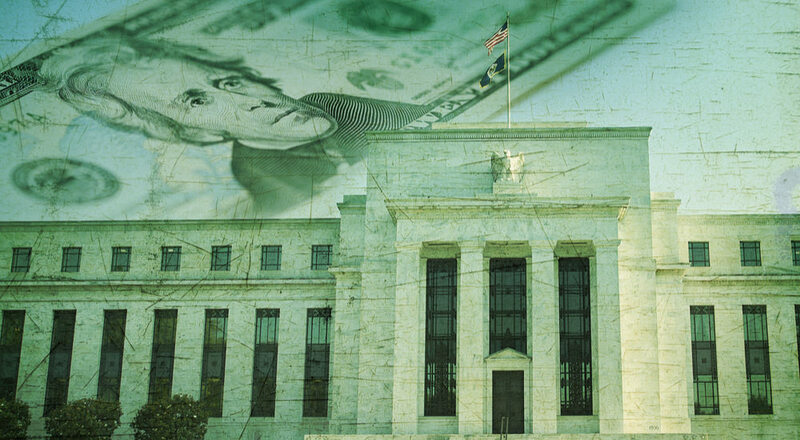 From day one, the Federal Reserve was known as a racket. And the racket continues on its way, unhindered, toward controlling the draconian cashless economy. Their manipulations are so complex that only the most brilliant experts – who President Trump now needs to urgently employ – can comprehend them.